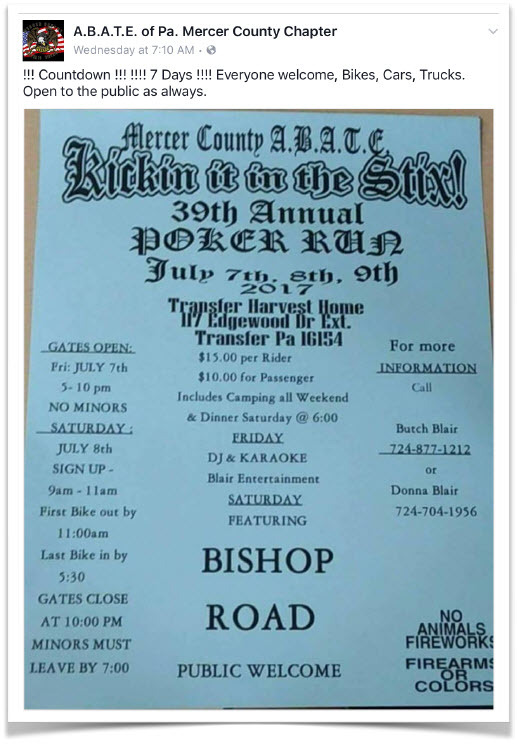 ABATE of Pa. Mercer County Chapter is holding its 39th Annual Kickin’ it in the Stix Poker Run in Transfer, Pa July 7-9, 2017. Although the excerpt on the ABATE of Pa. Mercer County Chapter Facebook page post says “Everyone welcome” the event Flyer makes it clear that “no colors” are allowed. ABATE is supposed to stand for the ideals of motorcycle rights, including freedom of expression and association. To ban motorcycle club colors at an ABATE event is antithetical to these ideals and runs counter to the historical origins of ABATE and the motorcycle rights movement. Club members started ABATE in most states. Currently, many patch holders are members of ABATE and regularly attend ABATE functions in many states. Clubs and ABATE are also working together well in many states and even at the federal level. The Motorcycle Riders Foundation (MRF), an organization largely made up of ABATE chapters nationwide, is committed to combating motorcycle profiling and discrimination against motorcycle club colors. In 2015, ABATE of Pa. was advocating for HB 1580, an anti- motorcycle profiling bill that 47 legislators sponsored. How can the current ABATE of Pa. be so far oﬀ the mark relative to their own advocacy in 2015, the rest of the country, the movement’s mission, and constitutional liberties? The MPP has worked with independents and ABATE members all over America that are passionately dedicated to fighting discrimination. Motorcycle profiling and discrimination is a motorcycling problem, not just a club problem. The MPP is appalled that an ABATE event in any state would ban motorcycle club colors or that a paying membership would not stand up and immediately demand a change in policy. It’s bad enough having to combat government and law enforcement discrimination. But when an organization that exists to educate and protect the rights of motorcyclists turns their back on motorcycle clubs it is a sign that something is very wrong in Pennsylvania. The post ABATE of Pennsylvania Turns Their Back on Motorcycle Clubs appeared first on Motorcycle Profiling Project. This entry was posted in Motorcycle Profiling Project on July 5, 2017 by Webmaster.